You may know that your Grandpa Frank hailed from Missouri, or that your Great Aunt Angie cooked Italian, but do you know your religious genealogy? Have you researched the religious beliefs and development of your forebears? I’d love to get a good conversation going on this. It is great fun to interview relatives to get the low-down on who was who religiously in your family tree, especially if you yourself have been searching, have converted from one thing to another, or have a partner whose spiritual backdrop differs from yours. Both my paternal great-grandmothers were Episcopalians in the late 1800s when they married outside their faith. One married a Roman Catholic despite the fact she forever seemed biased against Catholics (typical of a certain elitest segment in America at that time). The other great-grandma married a Presbyterian named after a minister in Scotland. This grandfather went along for the ride, and “yielded to my grandmother on the Episcopalian stuff,” says my 92-year-old dad, who has been a great source of family information generally. In the early 1920s, my paternal grandfather, a journalist, (son of the Episcopalian and the Presbyterian) came down with fullblown tuberculosis, a disease that had no cure at that time. He and my grandmother became Christian Scientists since prayer seemed to offer better hope for his recovery than mainstream medicine. They had five kids. They went on to found a Christian Science elementary school on Macomb Street in Washington D.C. But by 1926, my twelve-year-old father was being taught how to work the household furnace since his father was inevitably going to die. And when he did pass on, my dad’s Episcopal grandma, who had money, did little to help support her widowed daughter-in-law, Dad, and his siblings due to the resentment caused by the religious schism, Dad thinks. He loved his Episcopal grandma and even today doesn’t want to speak ill of her. Chances are great she thought Christian Science was hooey. Dad’s mother never wavered in her devotion, and later became went on to be a lay healer in Boston, where she moved to be close to the mother church. My father’s sister Jane, who never married, edited the Christian Science Monitor’s religious testimonials for many years. When my father (Christian Scientist) met my mother (Southern Baptist), they were united by their disenchantment with the faiths of their past. Once married in the late 1940s, they briefly attended a Dutch Reform church in Greenwich Village where they heard positive thinker Norman Vincent Peale preach five or six times. My parents eventually found happiness in a suburban Chicago “Union” church, which was mostly comprised of liberal Presbyterians. I sang in the choir there. Then I married someone who was Jewish. I hope I haven’t tired you with my story. Now tell me yours! Even if every relative adhered to the same faith label, chances are great there were wrinkles and variations in how that faith was interpreted. 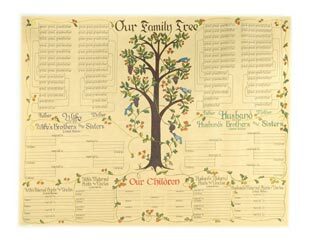 So what’s your religious genealogy? Does it makes you YOU?